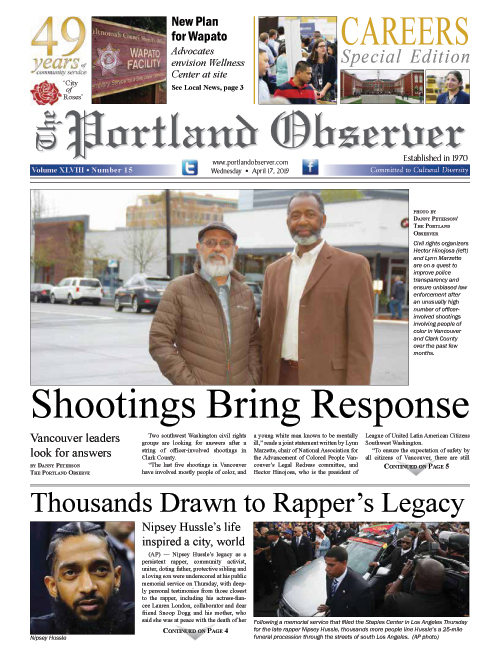 Beverly Corbell | 3/27/2018, 5:05 p.m.
Five candidates running for a future open seat on the Portland City Council appear together at a candidates’ forum sponsored by Black Voices United Saturday at Maranatha Church in northeast Portland. Pictured (from left) are Jo Ann Hardesty, Felicia Williams, Andrea Valderrama, Loretta Smith and Stuart Emmons. Photo by Mark Washington Jr.
A diverse group of candidates running for a future open seat on the Portland City Council voiced their concerns during a Black Voices candidates’ forum at Maranatha Church in northeast Portland Saturday, advocating for change on hot topic issues like homelessness, gentrification and racism. The five candidates, Andrea Valderrama, Loretta Smith, Stuart Emmons, Felicia Williams and Jo Ann Hardesty, answered questions posed by local moderator and civil rights activist C.J. Robbins, including their greatest concerns on and why they were running for the position No. 3 seat which will be left vacant at the end of the year with the political retirement of current City Commissioner Dan Saltzman. Black Voices United, a start-up community organization structure striving to create new educational and political spaces for the black community, sponsored the forum, which included an earlier session for Multnomah County Commissioner candidates. Andrea Valderrama, a David Douglas School District school board member and current City Hall staffer, said people may have good ideas for combating homelessness and housing shortages, but the City Council needs to adopt workable funding measures. Stuart Emmons, a Portland architect and community activist, said he has been a housing advocate for the last 20 years. Loretta Smith, a current member of the Multnomah County Board of Commissioners, who can’t run for re-election to her post because of term limits, has thrown her hat into the City Council race. On creating more affordable housing in the city, Smith said she wants to clean up polluted lots and build homes on them. “There is no question that housing is probably the most important issue for folks living in Portland and the state of Oregon. But there are opportunities we can take if we just push forward and be very deliberate and intentional about what we’re going to do. Smith said she also believes the city should consider housing the homeless in the long-empty and never used Wapato Jail in north Portland. “It doesn’t make sense that we have 88 people who have died in our streets last year when we have a building we spent $100 million for and that we spend $500,000 a year to maintain and has no one is in it,” she said. Emmons said he agreed with Smith on Wapato, and doesn’t think the city is doing nearly enough to ease the housing pressures. He released his own comprehensive housing plan last week, called the Portland Home Project.